The Rapid Air is designed to take anyone from the first time paddler to experienced rider onboard. Delivering relaxed floaty fun and next level surfing down white water rapids, there’s hours of enjoyment waiting to be had. Its width of 36″ and almost 300l of volume, you’ll stay securely on board for as long as possible. Four little HD fins support tight turns, allowing the board to slide through shallow waters. Built to last, the Double Layer HD Technology with additional rail reinforcement makes this river and rafting iSUP ultra robust. For the most convenient form of transportation, the Rapid Air comes with our premium Wheely Backpack including the new Fanatic Power Pump HP2 for quick inflation. 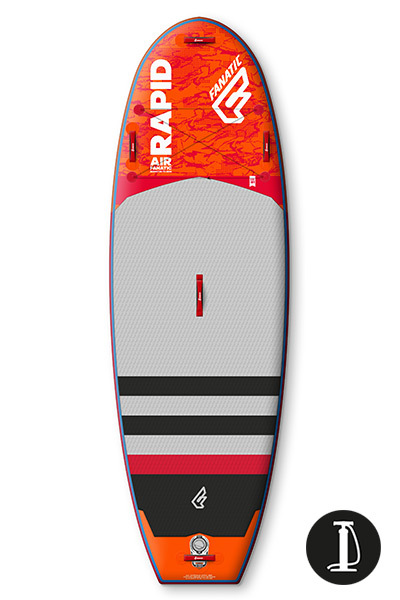 What do you think about the Rapid Air 9’6 x 36 (2017)?